Profitability Management in SAP Controlling is going to be continued and it is previously discussed in the previous post. Profit Center Accounting (EC-PCA) is a statistical accounting component. This means that it takes transaction data posted in other components and represents it from a profit-center-oriented point of view. The postings in EC-PCA are statistical postings , since the profit center is not itself an account assignment object in Controlling.The integration of the R/3 system makes it possible to post profit-relevant data to Profit Center Accounting automatically as soon as the transaction is posted. The system either transfers the relevant items from the original postings or creates additional postings. Profitability segments are the market channels or strategic business units that are to be analyzed in CO-PA. They may be combinations of product, customer, and sales structure information, and/or may encompass company code, business area, and profit center information.Since reporting margins and other profitability figures along marketing lines (as defined by these profitability segments) is the primary purpose of CO-PA, its design has been optimized for producing profit and loss statements under the cost-of-sales accounting format and philosophy.Profit centers are areas of responsibility within a company for revenues and expenses, as well as certain assets and liabilities in some cases. All profit centers are arranged into a standard hierarchy representing the entire organization. Since reporting performance information along responsibility-oriented organizational lines (as defined by this profit center hierarchy) is the primary purpose of EC-PCA, its design has been optimized for producing profit and loss statements under the period accounting format and philosophy. However, cost-of-sales accounting in EC-PCA is also now possible with the aid of functional areas. 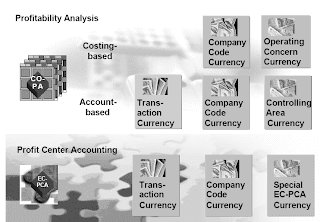 In costing-based CO-PA, all amounts are stored at minimum in an operating concern currency, which is specified in the operating concern attributes.It is also possible to configure the attributes to store values in the local currency as well; this has the effect of doubling the stored transaction data, though. n Account-based CO-PA stores all transaction in three currencies, the transaction currency, the local currency, and the controlling area currency. Profit Center Accounting can store transactions in the transaction currency, the local currency, and a special profit center accounting currency. Different decision-makers in a company need different types of information.For this reason, those responsible for the individual group companies require profitability data to be represented from the viewpoint of each company code and to match the income statement from external reporting.For the group head office, the group as a whole is generally the most important view. 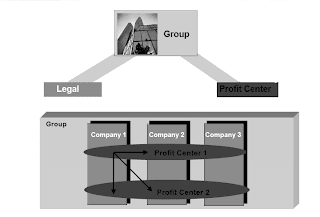 This means that the basis for decision-making requires the group to be represented as a business unit and to eliminate inter-company profits.Especially if company units such as profit centers are to be run like independent companies, the profit center managers require the equivalent type of information. In such cases, sales between profit centers within a company are also taken into consideration. The view of the individual company and the valuation of business transactions according to legal reporting requirements only represents one of several possible perspectives. Balance sheet and tax considerations play an important role in the financial statements of the individual companies.In addition to this legal view, though, successful corporate and group management needs other information that shows business activities from the point of view of the whole group or of individual profit centers. Corporate controlling for the entire group requires you to valuate these business transactions using group production costs. Moreover, in many groups the management structures do not correspond to the individual legal accounting units. Internal prices guide the activities of the individual profit centers according to market principles. Consequently, value flows represented from the point of view of profit centers are vital for the purposes of internal management and profitability. You can conclude as shown.